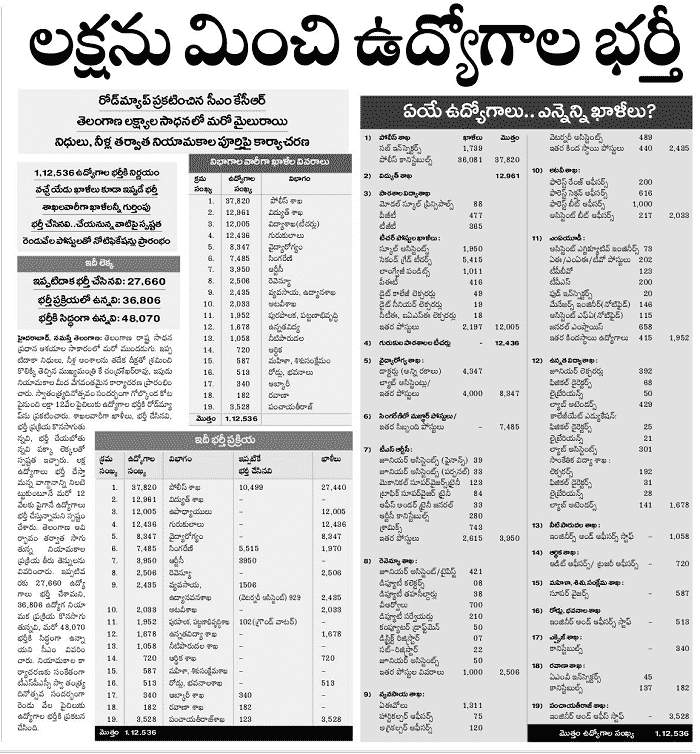 TS Govt Jobs: Various Posts to be filled by Govt. - Job bonanza for unemployed in Telangana - JOBs Recruitment Road Map: The state government will soon take steps to fill 84,976 government jobs, Chief Minister K Chandrashekar Rao said in his Independence Day address here on Tuesday. "On this happy and auspicious occasion of the Independence Day, I would like to give good news to the unemployed youth. I am happy to announce that besides 27,660 appointments so far we made, measures are being taken to make appointments for another 84,876 jobs shortly," he said. It was promised during separate Telangana agitation that about one lakh jobs would be provided in the new State, but more than 1.12 lakh recruitments are being made now, he said. With this, 1,12,536 posts had been created which were over and above the one lakh jobs that had been promised by the TRS government, he pointed. "TS to fill the Police Department, Electricity, Teachers, Residential School, Medical & Health, Singareni, RTC, New (Residential), Revenue, Agriculture & Horticulture, Forest Deptartment,MAUD, Higher Education, Irrigation Dept., Finance, Women & Child, R&B, Excise,Transport, PR Department posts..."
Massive job recruitment under Government of Telangana has been the trend since 71th Independence Day. On the occasion of India's Independence Day, Telangana Chief Minister K Chandrasekhar Rao has said that the government is all set to fill up close to 85000 jobs. The newly formed State, then, had promised for one lakh jobs; as of today 1,12,536 posts have been created added the Chief Minister. Appointments have been made for 27660 posts so far. Recently, Telangana State Public Service Commission (TSPSC) has released job notification for different posts at the official website tspsc.gov.in. TSPSC will conduct written exam (computer based or offline OMR based) and interview and /or other tests as per the requirement of the post, for selecting candidates. The exam will be held in October 2017. TSPSC Web note: The candidates are here by informed that there will be a Common Written Examination for Paper-I, i.e., General Studies & General abilities on 08/10/2017 F.N for the posts of 1) Civil Assistant Surgeons (Specialists)(Notification no. 40/2017), 2) Dental Assistant Surgeons (41/2017) in TVVP, 3)Tutors (42/2017), 4) Lecturers in Radiological Physics and Physicists (43/2017)in DME and 5) Civil Assistant surgeons (44/2017) in IMS and Paper-II, i.e., concerned subject will be conducted separately as shown below. And Examination for the post of 6) Assistant Physiotherapist (45/2017) in IMS will be conducted on 09/10/2017 F.N & A.N. The detailed Examination schedule is as follows. 'Before applying for the posts, candidates shall register themselves as per the One Time Registration (OTR) through the Official Website of TSPSC. Those who have registered in OTR already, shall apply by login to their profile using their TSPSC ID and Date of Birth as provided in OTR.' The last date for submission of application for Forest Beat Officer, Forest Section Officer and Forest Range Officer is 12 September: it is 15 September for other posts. The Commission will conduct recruitment examinations on 27 and 28 August for posts notified earlier. c. 48,070 - New vacancies for recruitment. This is a big bonanza of 84,876 jobs for the unemployed youths in the State. This includes 48,070 new vacancies and 36,806 posts for which the recruitment process is at different stages. The recruitment process was already completed for another 27, 660 posts that were announced previously. The Police department would account for 37,820 posts (10,499 already appointed) would be largest job provider in this round of recruitment drive. The power utilities including the Transco, Genco and Discoms will be filling up 12,961 vacancies while the Education Department will be filling 12,005 teacher posts. The historic Golconda Fort, wherein he unfurled the tricolor as part of the Independence Day celebrations, echoed to thunderous applause as he declared that the recruitment process will taken off in the coming months. He informed that the Government would take up recruitment drive this year even for the vacancies that would arise next year in different departments. The Residential schools and the medical and health department would be notifying 8,511 and 8,347 posts respectively. The breakup of posts in other departments is 7,485 in Singareni Collieries (5,515 already appointed), 3,950 in TSRTC, 3,925 in new residential schools, 2,506 in revenue department, 2,435 in agriculture and horticulture department (1,757 already appointed), 2,033 in Forest Department, 1,952 in Municipal administration and Urban development, 1,678 in Department of Higher Education and 1,058 in Irrigation Department. The Panchayati Raj department will notify in all 3,528 posts. The Departments of Finance and R&B have 720 and 513 vacancies to be filled soon. In all 587 posts would be notified by the department of Woman and child welfare and 340 by the excise department. As many as 182 vacancies would be filled in the transport department. Official notification for the recruitment announcement made, will be notified at the official website of the Telangana Public Service Commission (TSPSC), tspsc.gov.in. Meanwhile, candidates who are ready to appear for recruitment examinations, scheduled for 27 and 28 August, should go through the exam guidelines. Taking the exam schedule of Staff Selection Commission into consideration, TSPSC has changed the exam dates for the recruitment examinations schedule for 12 and 13 August.